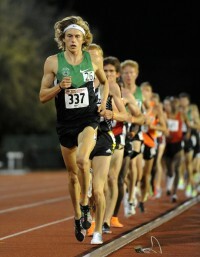 Running from the second heat, Evan Jager logged a tidy two-second personal best at the Oxy High Performance Meet put on by USATF. Lopez Lomong crossed the line fifth in the top-seeded heat, beating World bronze medalist Matt Centrowitz, but it was Jager who finished second overall in the standings, thanks to his 3:36.34 — a time second only to Nick Symmonds. Mile specialists Andrew Wheating and Olympic silver medalist Leo Manzano also were bettered by Jager’s performance in Heat #2. Lomong ran 3:37.08, with Elliott Heath clocking a new PB of 3:39.85 in the third heat. Up ahead for the KIMbia crew is the Prefontaine Classic on Saturday June 1st.